Child of the Summer Sun. Born to the Strife of the Delta, but Resilient as the Cotton in the Fields. Strong as the Mountains the drew me away, Granting new Life. Grianstad an Gheimhridh Shona, y’all! It’s hard to believe it’s that time again! Yet here we are. I feel like a lot has changed in the last year, and yet this was a ritual that felt familiar. I’m hopin by next year to have somewhat of a solidified liturgy, but I made the decision a long time ago to let that kind of thing develop as naturally as I could. I don’t wanna force somethin and end up hatin it or it feelin disingenuous. That said, the format and connection to other holidays has really taken shape this year. I’ve come to a lot of realizations and, through talkin to other Gaelic Polytheists in various locations across the country and the globe, I feel like things are takin shape in more concrete ways. Discussions of local cultus in the South, most of whom seem to be Hellenic Polytheists, has also truly had a major impact. It’s helped me flesh out my own ideas as well as solidify the idea that we don’t all have to practice identically and never even did. The idea of true orthodoxy simply doesn’t fit into my understanding of a Gaelic Polytheist worldview. Which brings me to this year’s ritual. In the last year, I’ve truly come to see Gráinne/Grain as Áine’s sister. I realize in retrospect that I’d somehow come to view her as an enemy or adversary. I think it has to do with my own struggles with winter that led to that, but one day it was like a light turned on and that idea just seems so foreign to me now. As such, I altered the idea of the ritual to be about transitioning from the time of Áine to the time of Gráinne rather than about somethin more akin to tolerating the winter. In a Gaelic worldview, days begin with sundown of the calendar day before, similarly to the way Jewish days run. I was out of town visiting family for an early Christmas since I’ll be workin on the 25th, so I knew I couldn’t do a full ritual that night. Before leaving and while the sun was just barely still in the sky, I burned a stick of incense I reserve for Áine, thanking her for her warmth and wishing her a speedy return. Before I went to bed that night, I lit a small jar candle that I’d got to use that felt appropriate for Gráinne, said a quick prayer, and let it burn overnight. I’ll admit that I had more time and expendable income this year than I have in a long time and likely more than I’ll have again for a while, so I splurged a little. I found a gorgeous white candle that transitions to gold that I feel really represents the transition from the pale face of the winter sun, Gráinne, to the warm yellow summer sun, Áine. I doubt that I’ll ever find a candle that does the opposite (I looked and didn’t see one), but it’s given me ideas for ways to incorporate those color transitions in the future. As for the ritual itself, I started by lighting the gold taper candle and thanking Áine for her warmth and presence. I then used this candle to light the the two white votive candles. 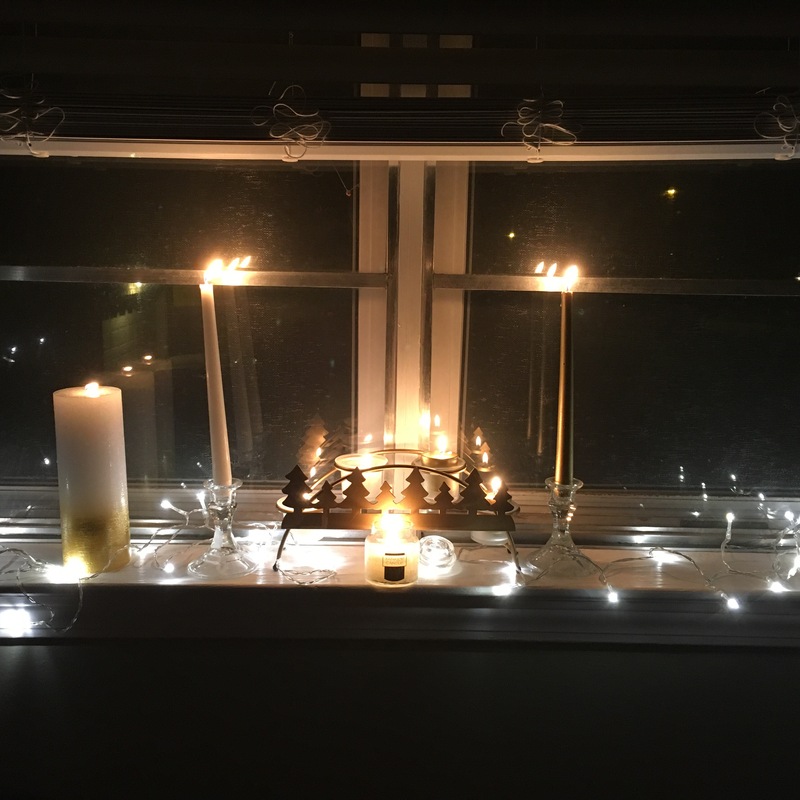 From these candles, I lit the white taper representing Gráinne, then lit the gold votives. Really, this was all symbolism of the rising and setting sun, the transition of the seasons, etc. 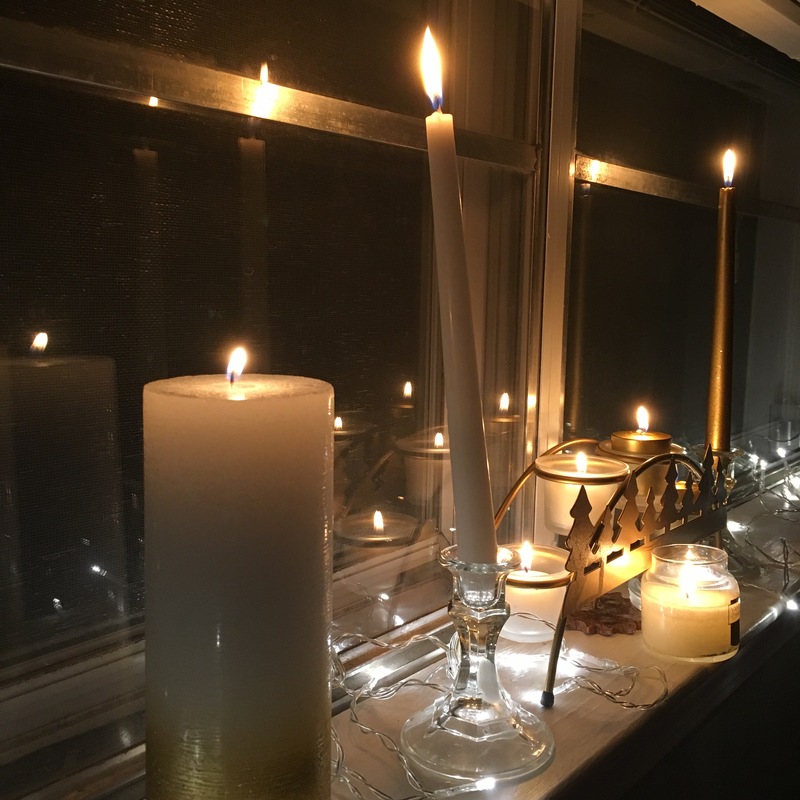 Lastly, I lit the white and gold pilar candle, talkin to Gráinne and askin that she keep us warm, drive away the bitter cold the An Cailleach brings, and that my relationship with and understanding of her grow. I let all the candles burn until they burned out, except for the pillar, which I put out when I left for work tonight. I think I wanna burn it again, maybe every couple weeks or somethin and time it to be about done by the time Grianstad an tSamhraidh hits. In the future, I really wanna repeat this ritual, in reverse, to welcome Áine at Grianstad an tSamhraidh. But at the same time, this doesn’t feel totally right. I don’t know if it’s cause I’m in the South and our days are longer or what, but by the time the solstices roll around, we’ve been in the swing of the season for a while. I’ve never been one to do much with the equinoxes, but I’ve been entertainin the idea some kind of small recognition of the beginnin of this transition. It’s not been more than a passing thought, but it’s definitely an idea I want to explore. All in all, I feel like it was a successful ritual. As a side note, the little strings of lights were an impulse buy while I was at Target. They were just festive and on sale, but I really think they added a nice touch. They’re not somethin I leave on their shrine all the time, but in this year of transition and without any other holiday decorations, it just felt nice.